This notable home was designed by Frank Lloyd Wright for Aline Barnsdale, a Pennsylvania oil heiress. His son Lloyd Wright built the home, and Rudolf Schindler supervised the design. Aline Barnsdale originally envisioned the creation of an artists’ colony of sorts. Her complete vision was never realized. The home was an attempt by Wright to find an architectural style that was representative of Southern California. He called it California Romanza. In keeping with a major theme of Los Angeles architecture, each of the rooms of the house connected to an outdoor space via patios, terraces or gardens. The home and surrounding acreage was donated to the city of Los Angeles in 1927 as a tribute to Aline’s father Theodore Barnsdall. 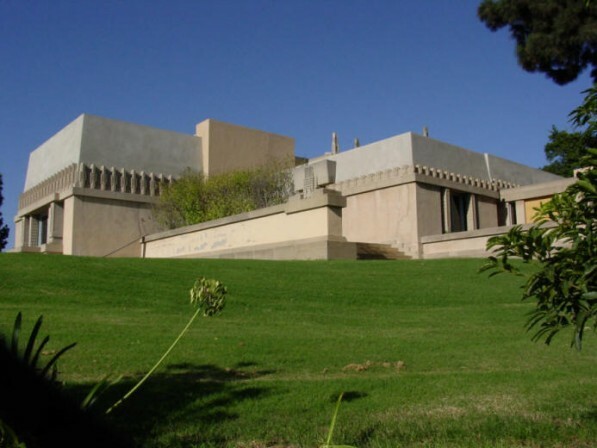 The house is now the center of the Barnsdall Art Park and is available for public tours. This entry was posted on Thursday, November 18th, 2010 at 7:06 pm	and is filed under architecture & design. You can follow any responses to this entry through the RSS 2.0 feed.